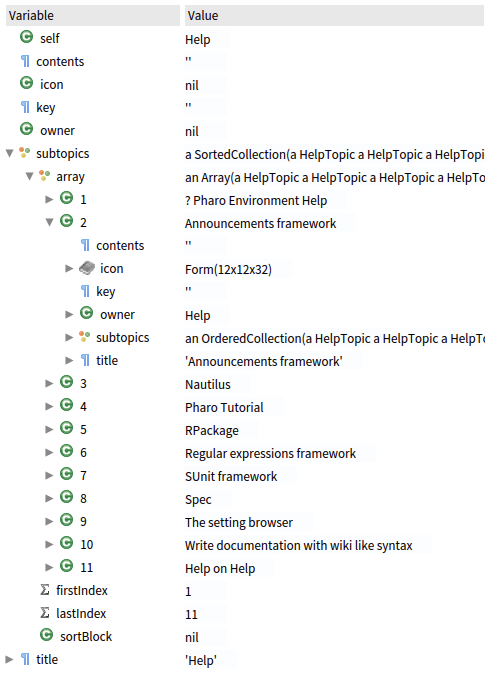 Hence, the entire help is stored as a tree of HelpTopic objects. Help Browser provides a user interface for exploring the content of this tree. 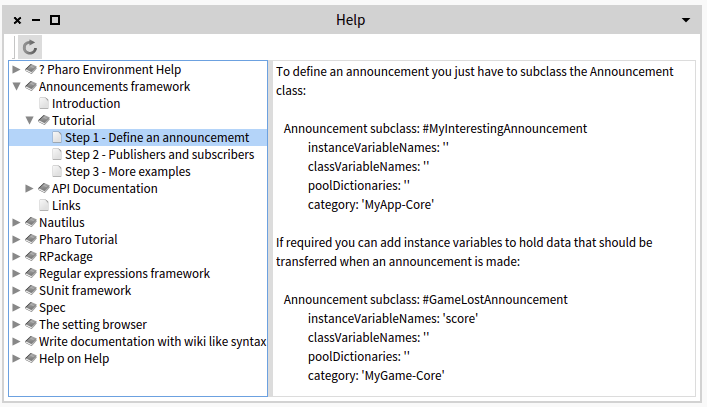 This, however, is not the best approach for exploring the content of a HelpTopic object, as ones has to permanently expand and collapse objects in the tree view. To provide a better mechanism for exploring the content of a HelpTopic object we can extend GTInspector with two custom views. To create the view we first indicate that we need a text view and configure the view with a title. Then using the display: method we set the block used to get the actual object displayed by the text view; in this case the content of the topic object. Last by not least, we use the when: method to only display the view if the topic object has actual content. Here the display: method returns the root elements of the tree. children: is used to extract the children of a node. format: sets the block used to transform each node of the tree into a string. Now, when inspecting a HelpTopic object we get directly in the inspector a simple tool for browsing the content of such objects. 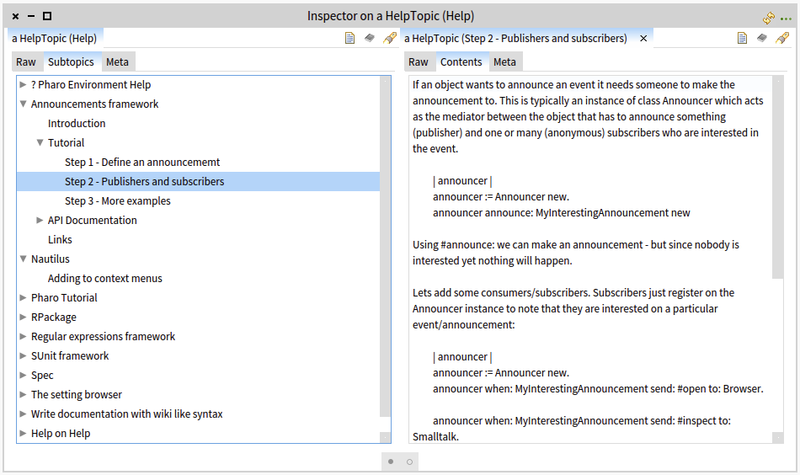 We can use this inspector to explore both the implementation and the content of HelpTopic objects. 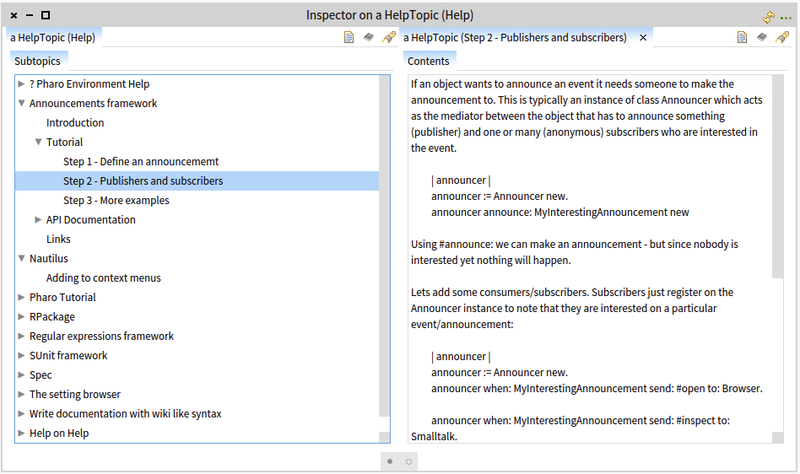 HelpTopic is just an example of a domain object interesting from both an implementation and a domain-specific point of view. Many other domain objects have similar requirements. The GTInspector makes is possible to easily create custom views for objects so that they can be inspected from multiple points of view. – Many thanks to Torsten Bergmann for starting this extension.